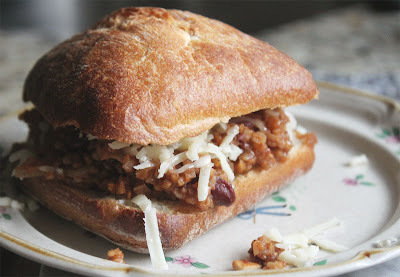 To continue with some of my favorite quick meals, I thought I might share my take on the vegetarian sloppy joe- it is big on protein, flavor and fiber, and is a great way to use up left over chili. Start by cooking the bulgur. In a small sauce pan bring the bulgur, water and salt to a simmer, cover, and let cook for about 14-18 minutes, or until the bulgur is tender. Once it is just about done cooking, heat the vegetable oil in a large frying pan and sweat the onion. Once the onions are translucent add in the garlic and cook for one minute, and then season to taste with salt. Add in the wine (or other liquid), barbeque sauce, mustard and cumin, and cook together for one minute longer to cook off the alcohol. On medium-low heat add in your chili. I like to smash all the kidney beans just so the finished sloppy Joe mix has a more consistent texture, but you can leave them whole if you like. Once everything is mixed together, add in your cooked bulgur and season to taste. I like mine on a toasted ciabatta roll with extra sharp cheddar, but you could just as easily eat it like my son- out of a bowl with crackers. WOW!! Just talking a/Kat last night about me getting some menus started for each week to try and eat better--this will be on the menu for sure!!! Thanks! Yum! Make some for my next visit! Hi! Visiting from PR&P. I had no idea you were a chef! I love this Vegetarian "Sloppy Joe" recipe. It looks like something my little ones will also enjoy. Thank you!! !